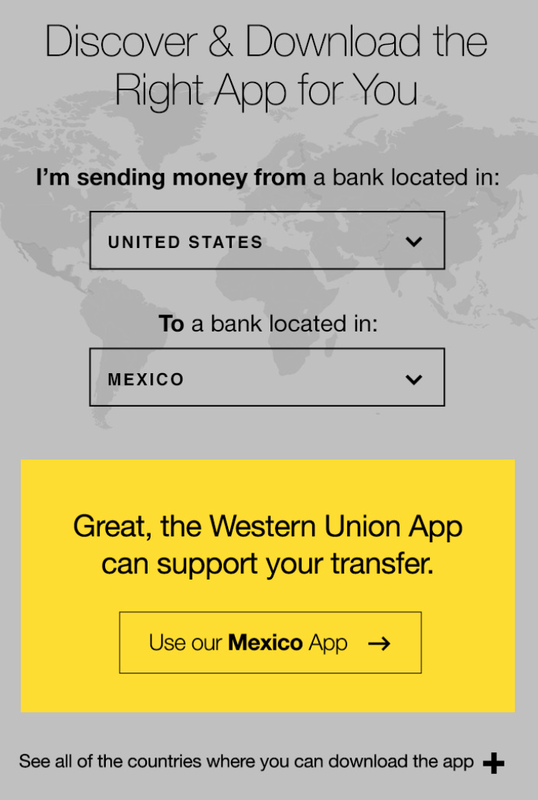 Following the build of a similar project, Western Union solicited the creation of a content page about mobile money transfers and the launch of its new global apps. The page would draw site traffic from influencers and journalists, but also promote app downloads. 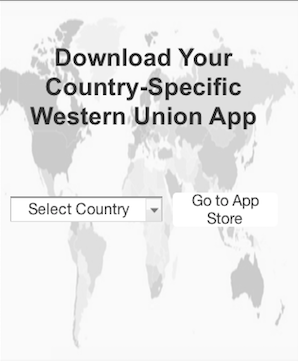 With the creation of the ‘The Future of Mobile Money’ page it was clear Western Union wanted to raise awareness and drive downloads for the release of its 62 country-specific apps. However, what was unclear was the approach. The challenge was striking a balance between creating a very targeted, product-centric page and creating a broader, informative narrative. For this project I worked with a content manager, product manager, art director and senior UX designer. I created the UX design approach, produced wireframes, drafted annotations and presented design artifacts to the client. The first step in my discovery process was assessing the older Western Union blog page: 'Currency at a Crossroads," from which the client wanted to draw inspiration but not parrot. Another source of inspiration came from Apple's HomePod page because of the creative and engaging storytelling of product features. I was most inspired by the interactive experience on Fitbit Charge's product page. A scrollable vertical carousel served as a unique vehicle for displaying content. One of the main design obstacles was manipulating the main content block: six Latest Trends on mobile transferring. The content needed to have prominence on the page, but still be engaging and easily scannable. Different options for presenting the content on desktop/tablet and mobile were drafted. The final wireframes followed the Fitbit Charge model; all screen sizes were designed to follow the same model. However, the visual design on mobile had to be altered as the copy atop the background blocked most of the image and was difficult to read. One of the requests for the page was a world map showcasing the different countries with a Western Union app. The challenge was determining how to offer an interactive experience that was mindful of screen real-estate and the resources available for the build of the page. I designed an experience that began with the map animating onto the page. The map then became background for a drop-down menu, where users could select the appropriate Western Union app to download. 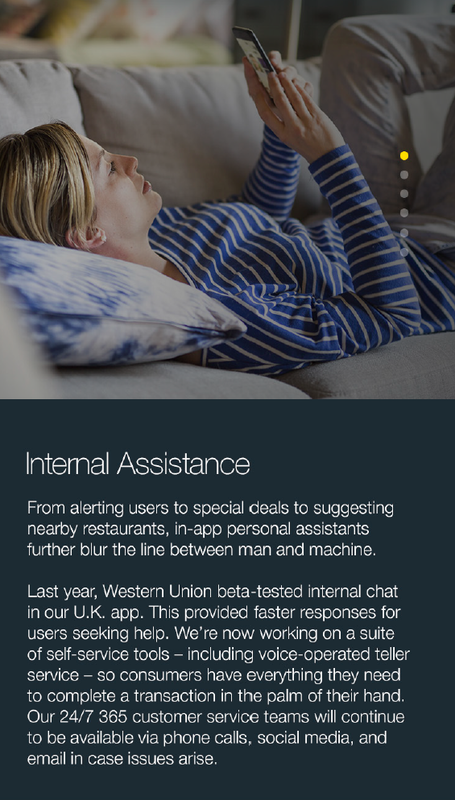 In response to client feedback, the section was altered, enabling users to input information to determine if there was a WU app available and if so, which to download. Because the nature of money transfers can be complicated and the audience for the page was so diverse, I used an input format that was simple and utilized a sentence structure. The map section required a drop-down menu to offer users the option of browsing and selecting the appropriate country app. Design inspiration came from the Olympics page; I replaced the game icons in the CTAs with country flags. Part of the on-going conversation regarding the tone of the page, was how to present data collected for the page. Initially, I designed the data as a separate content section towards the bottom of the page. However, team feedback was to better integrate the data and increase the hierarchy. I suggested and implemented a sidebar to the page introduction as a solution. Because the build of the page was being handled by the client, it was particularly important to have detailed annotations for the final design files. I annotated the visual design assets, which were produced by the visual designer.